Steve's Bus & Train Page: Steve's Multi Coloured First Post! Hands up all who can accurately describe First's current livery. Come on now be brave and have a go! Well yes obviously lilac but what about the front? Dark Grey I mean RAF Blue? Purple? Red? I was having a browse in Flickr yesterday and decided to see just how many colours I could find and here is what I came up with. All pics are published under Creative Commons Licence, however I thank everyone for allowing their pics to be downloaded, especially Graham Richardson from Plymothian Transit and Bryan Dickson who has allowed me ot use his pic of freshly refurbished Ipswich B7tl 32492 as seen in the Town on Saturday - it's first day back in service. 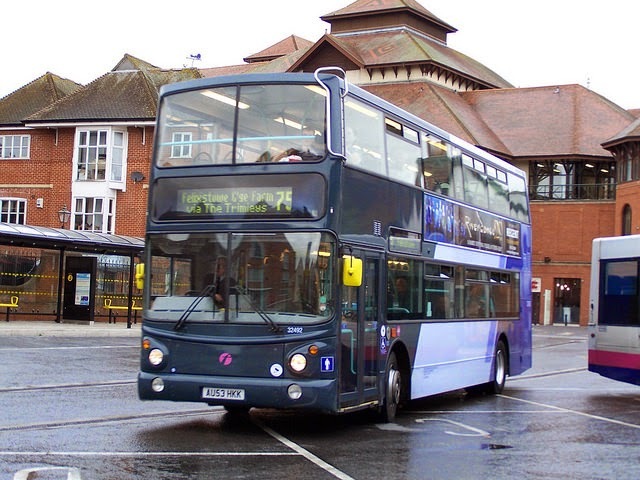 We start in the Potteries and this pic of Ex First Leicester Volvo B7l 66307 sporting a face like a smacked bum! This, and the following two pics were taken by the brilliantly named Cliff the Milk, and you can see his rather good Flickr page by clicking here. Incidentally in the description Cliff mentions that only seat frames are in the vehicle so one wonders if the seats were refurbished too. If so then there might be hope for the Norwich fleet of B7l's too. Next up a pic I think I posted a few days ago but from a different source. 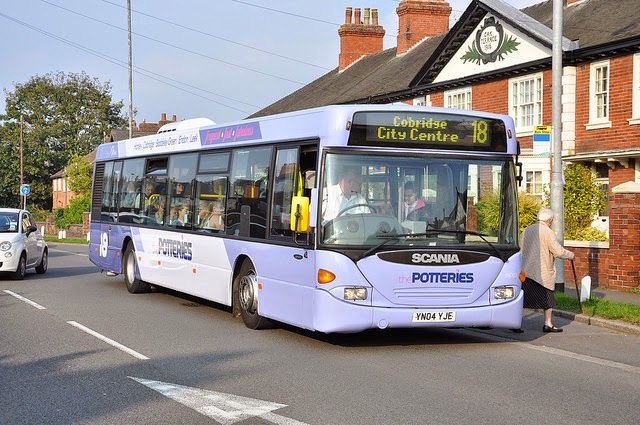 This is one of First Potteries new Streetlites, this time in a purple edition of the livery. Lastly from the Potteries we see Scania Omnicity 65003, which is painted in First's Interurban livery. Not sure what colour to describe the front - Lavender maybe? 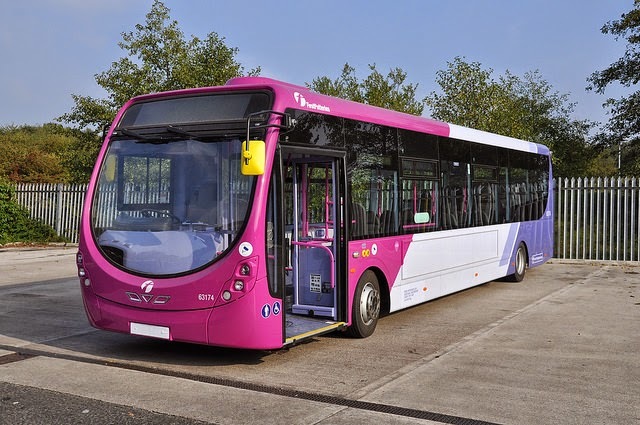 From the Potteries we move to Chester and to their Park and Ride, operated by First. Here is Volvo B7rle 69495 wearing the royal blue front I was convinced Ipswich would end up with - still think they should have really. The pic is by Duncan Payne, whose Flickr page you can access by clicking here. And now to Manchester and is this where it all started? 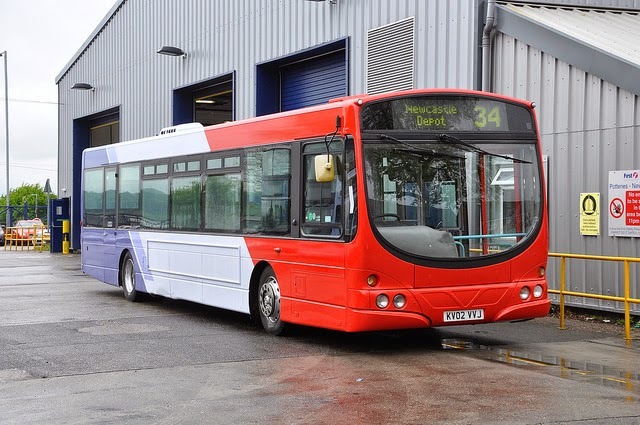 Pictured is First Manchester Metrobus 30335 with a bright yellow face. 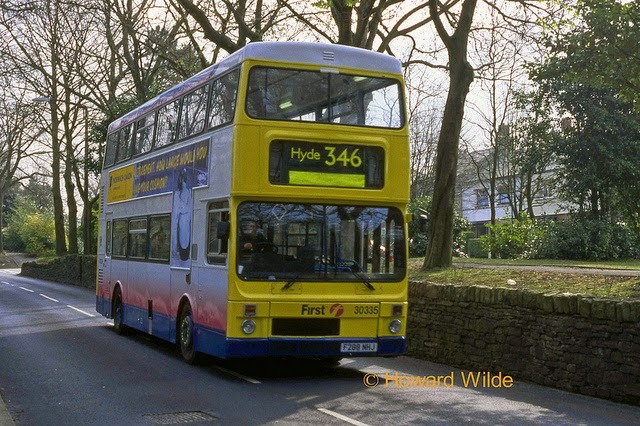 Picture taken by Howard Wilde in April 2003 this ex Capital Citibus Metrobus was used primarily for school work, hence the yellow front, but was used often in regular service too. You can access Howard's Flickr page by clicking here. 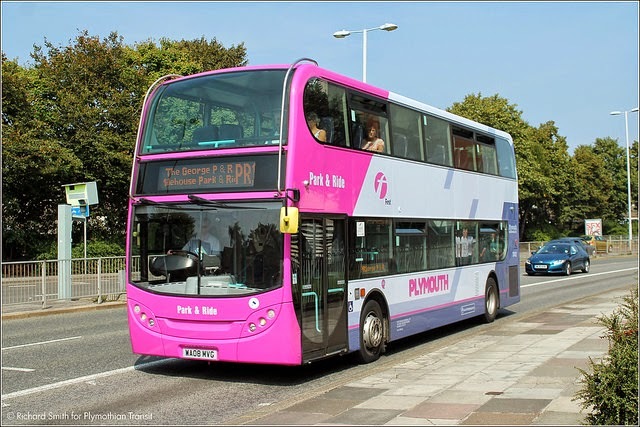 From Manchester we take the long trip down the M6 and M5 to Plymouth, where the lucky Devonians have probably the most garish colour of them all - one that the Pink Line in Norwich can look forward to with glee! Here is First Plymouth's E400 33422 WA08 MVG. This excellent pic was taken for Plymothian Transit blog by Richard Smith, but appears on Graham Richardson's Flickr page, which you can access by by clicking here. And so finally back to Ipswich, and the latest refurbished B7tl to hit the streets, 32492. You can access Bryan Dickson's Flickr page by clicking here, and once again my thanks to all the photographers for making their pics available for everyone to enjoy and share. We share the same philosophy and it's just a shame so many are so possessive. Anyway I hope this has given an indication as to how Norwich might look next year, except I couldn't find any green or orange or turquoise! What a colourful City it will be! A absolute rainbow of colours here in a great selection of pics... First taking inspiration from Go-Ahead? GA tend to have multiple liveries within their areas. The pink and yellow are garish it has to be said, however the presentation of all concerned seems to be a distinct improvement on the scruffy offering we tend to get here in Norfolk, unless we use the X1 of course. Oh, "Duncan says it is still First Potteries, although unless it's moved Chester isn't that close to Stoke so someone will have to confirm that" - if you Google First Potteries, the first site is this; www.firstgroup.com/ukbus/staffordshire_cheshire/ so make of that what you will. It is an odd fit though I agree. I'm going to admit it - after initial horror at what is planned for Norwich I'm now quite looking forward to it, and I think it will brighten up the City very nicely. HOWEVER at the moment there are far too many cross workings from colour to colour and these will have to be re-diagrammed and coloured buses stay on their routes. The generic buses will have to operate any cross working diagrams. I am available to do the re-diagramming - I like that sort of thing! Steve, you have changed your tune - what a 180. I'm with you though, I'm sort of looking forward to it too. It will at the very least improve the presentation of the Norwich fleet, which is (to put it politely) rather lacking at the moment. Out of interest, do we know what the colour scheme (aka the colour of the front bit) is going to be on the generic Norwich vehicles? I'm sure it's been said on here before, but can't remember offhand. Agree agree agree re the cross workings, there are way too many (I'm sure you'd bring that right down with some smart re-diagramming), and for the colour branding to work properly that number really needs to reduce. Why? Well, some/many of us on here will know why colour branded vehicles can (and do) end up, intentionally or otherwise, on the 'wrong' route - we may not like it, but we understand it. For people who don't know though, why, when they see it happen, would they think anything other than 'lazy'? Which I presume isn't the intention of the branding. I heard from the Norwich boys (so blame them if it's wrong) that the unbranded vehicles would be plain Corporate livery, not white as they are now. I'm sure "lazy" isn't the intention of branding but that is quite often the result as has happened with the X1 in Gorleston. The good people managed quite well with white or lilac, but nearly all blue in a special livery and occasionally lilac baffles the poor loves apparently. So heaven help us if people in Norwich waiting for an orange bus get a purple one. Much short circuiting of brains I think! I love the lavender one on the OmniCity, it looks great! That grey doesn't stand out when it heads towards you while waiting at the bus stop. I think that was always the envisiged problem amongst those expressing doubts. It looks all well and good gleaming in the sun, but how would it look on a murky Winter morning. I guess the next few months will prove it one way or the other. I thought First sold off their Chester operation to Stagecoach, but it seems to be the habit that they "keep" contracted services, perhaps because they can't afford to pay the compensation which a transfer or contract amendment would require (as everyone needs to make money these days). More locally didn't they do the same transferring the Luton Airport shuttle to Essex, when Northampton closed (where there was next to nothing left to sell off)? First Business Management seems an esoteric art, but you'd have to ask your mate at FEC about that one! All I can work out is that the first (or even First) mantra is that there is no such thing as bad publicity! It's probably a 'contracted services' thing, along the lines of the Luton Airport shuttle. Or, saying that, it could be a business management thing; going by a quick read through of the First Chester Wiki page it seems First Chester (and Wirral - which was sold to Stagecoach) was part of First Manchester, while First Potteries was (and still is I believe) part of First Midlands. Yeah, First do seem to be consolidating (aka retrenching): into Essex, surrounded by the Arriva doughnut; their "key" commuter routes into Ipswich; and the "Norwich Network" thing - where I get the colouring - it reinforces the concept which develops the public interest in getting on the buses and the brand loyalty once they're on, delivering the Holy Grail of profits. (Well, that's the theory). Can't help feeling though that the cake has a missing ingredient. What could that be, I wonder? Now where are those profits to be found? As for colours, I just don't go for the wishy washy or rainbow stuff. It just makes me think of someone who doesn't know what they want, so tries to be timid and inoffensive. Or have a problem with their identity. I prefer bold, simple and bright, which seems to mean know it's own mind and not ashamed of itself. Probably a character flaw, I always recall my first boss who wrote in prospective references to everybody that I didn't suffer fools gladly . . . And I always recall the time I had a light green car, everyone kept crashing into it, as they just didn't notice. So I've always tried to avoid anything that looks like grass or the grey English skies ever since. Anglian's yellow stands out well as did the red fleetnames. The new style just blend in. I agree. Konect's livery is simple yet effective too. I totally agree - quite often the "bus" part of Anglianbus can't be seen - the same as the "First" in the lavender FirstPotteries pic above which makes the vinyls look misplaced. Dunno, they seem to have rehashed the old "no change to our strategy and financial guidance" (if you can call it that) press release. Herald the 2% odd yoy passenger/revenue increase! Where do they think the growth is coming from? It always reminds me of the old comment on the terminally ill "as well as can be expected". But problems are always in the head, aren't they? To me the bus business, where they are in control, is the bedrock. The rail business is in someone else's control (and where it's politics, a capricious one at that). But it's the appeal of gambling, the winner takes all. All OK, unless you're the loser. So the rail business is the star of the show, and the bus the poor relation. But I'm not a chief executive or chairman. Thank goodness. There may well be more money, unless they were relying on income from Scotrail to fund activities elsewhere within the group. Will they spend it on FEC though? I was very surprised to see First lose Scotrail. i thought that was one operatioon they were getting right and certainly my experiences earlier in the year were first class (puns definitely intended). At least Abelio haven't got Douglas "twit" Carswell as an MP up there so if there is 8ft of snow in the Cairngorns and trains can't get through no one will will be wanting them stripped of the franchise! 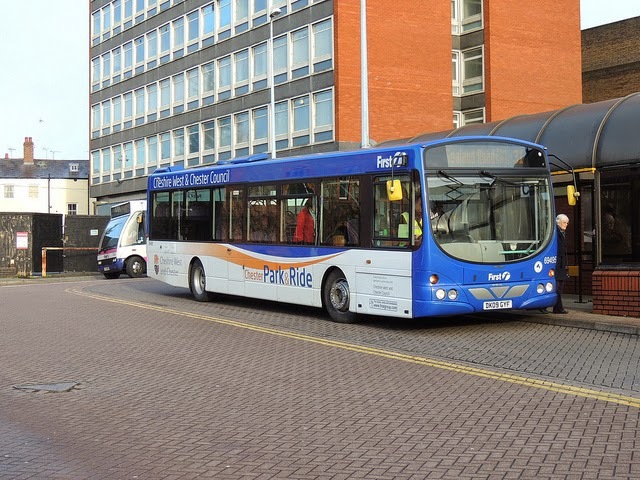 Chester park and ride livery was designed by the county council. And these colours are still worn by the buses which are now owned by Stagecoach. Are Trams the Smart Way Forward?